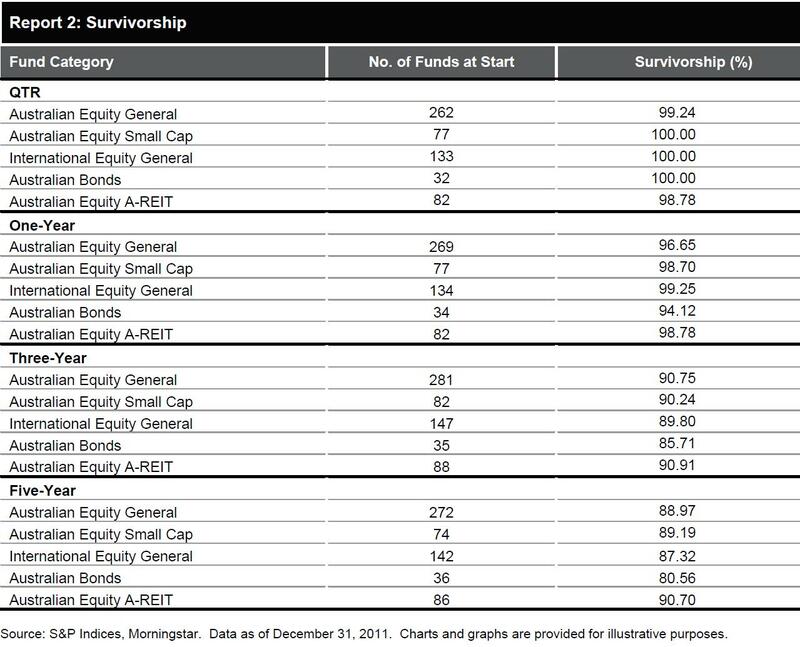 The SPIVA report was released a few days ago and as I’ve mentioend before it is my favourite assessment of the success of fund managers because it takes into consideration survivorship bias…in other words, if you want to know who are the best fund managers over the last year, then you start with all fund managers from one year ago and assess all of them as opposed to assessing the fund managers who are left (and therefore have survivorship bias). Anyway, I digress…if you want the SPIVA report just click here. In terms of success of Australian fund managers, as Report 1 shows it appears that only Australian Small Cap Equity managers consistently have the ability to outperform their respective index with almost 80% of managers doing so over the last 5 years. Report 1 also shows that Australian bond managers have really struggled to outperform the UBS Composite over the last 5 years with more than 84% failing to do so. As a result its unsurprising to see Australian bond managers have the lowest level of survivorship…Report 2 below shows the last 5 years saw almost 1 in 5 managers drop out of the performance race (i.e. 80% survivorship). OK, so what does this mean? Does it mean you should buy index funds over actively managed funds for every asset class except small cap Australian equity?or forget managers and do it yourself? The SPIVA report and the above results certainly mount an outstanding case for the index manager. There are numerous research houses out there who believe that it is possible to pick the good active manager who can beat the index but unfortunately these research houses haven’t been held to account for their predictions and we don’t really know if they truly are successful manager pickers. Whilst there are many active managers with demonstrated outperformance over long periods of time, unfortunately the longer they survive the lower their probability of performance persistence as increased funds inflow make it more difficult to execute best ideas. If you cannot resist temptation, you absolutely MUST NOT manage your own money. My thoughts have been and continue to be that, with the exception of the small cap manager, the large cap equity or bond index manager should have a prominent place in all diversified portfolios due to their low cost, transparency, simplicity, and the fact you pretty much know what return you will get…i.e a little less than the index. I do admit that I’m concerned with the longer duration of the bond index and my belief that duration is not the best long term place to be but nevertheless, that makes me an active manager and I might be wrong! I believe active managers have a definite role in diversified portfolios but they should be considered as having increased risk (i.e. underperformance risk) and therefore the use of active managers (or direct undiversified portfolios like stock portfolios) should increase in line with the risk profile of the investor.